Dozens of Dempsey Middle School students spent their recess or study hall Monday and Tuesday working on an unconventional project; sewing sleeping bags for homeless people. The project was organized by Donna Imel, the founder of SHARE: Taking Responsibility Together, who has been working with the school for eight years to create sleeping bags for the homeless. Imel said the project actually started more than 30 years ago and that she just started the Delaware chapter of the sleeping bag project. Imel said the project is now in every state and many countries around the world. Nicki Wright, a career based intervention specialist at Dempsey, volunteered her classroom for the project Monday and Tuesday and said students were permitted to leave their recess or study hall periods to come to her room and sew the sleeping bags. Wright said students also made posters to promote the project and said that students come throughout the day to work. Wright said on average, 10 to 12 sleeping bags are made per day. Imel said all the materials for the sleeping bags are clean donated blankets and mattress pads. Imel added that the sleeping bags created by students will go to the new Delaware Warming Center at Zion United Church. “It’s a teaching tool for students,” Imel said. Imel said that all students either know someone who is homeless or at least know of someone who is homeless. “It’s hitting everyone even if it isn’t personal,” Imel said. Imel said since she has done the project she’s never had to reach out to groups or organizations for support because they are always coming to her, willing to help. “Everyone should have a place to sleep, dry and comfortable,” said Alayna Camara, an eighth grader. More information about SHARE can be found on www.shareyourbest.us or by contacting Donna Imel directly at 570-977-6018. 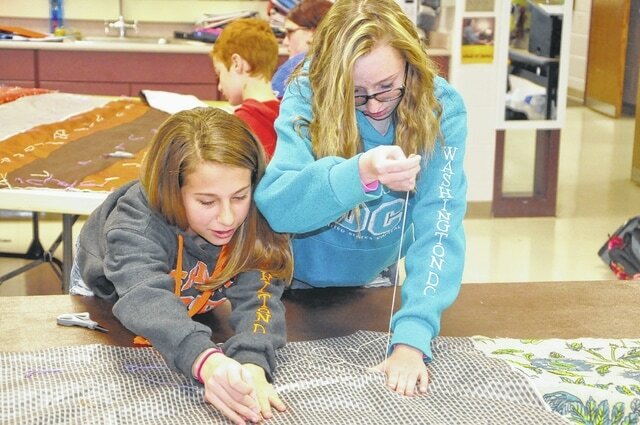 Erica Armstrong (left) and Amber Cromlish (right,) seventh graders at Dempsey Middle School, sew a sleeping bag Monday morning in Nicki Wright’s classroom. http://aimmedianetwork.com/wp-content/uploads/sites/40/2015/11/web1_Sleeping-Bags.jpgErica Armstrong (left) and Amber Cromlish (right,) seventh graders at Dempsey Middle School, sew a sleeping bag Monday morning in Nicki Wright’s classroom.